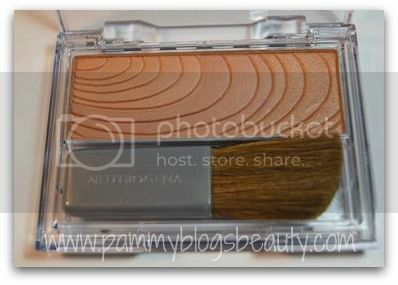 Pammy Blogs Beauty: Neutrogena's Healthy Skin Custom Glow Blush and Blush/Bronzer Duo: Get Glowing! Neutrogena's Healthy Skin Custom Glow Blush and Blush/Bronzer Duo: Get Glowing! What are you using to get glowing these days? Nothing beats a good blush and bronzer for perking up your complexion! In a season when many are looking tanned and bronze, a fair girl like must rely on good bronzers to get a "tan". These Healthy Skin products from Neutrogena have been helping me to get that "summer color" that I crave! So far, my exploration of Neutrogena's Cosmetics line has been quite successful! Their Revitalizing Lipbalms and Nourishing Eyeliner have become some of my go-to products this Summer. If you missed my review of these items, feel free to check that out here: New From Neutrogena. This review is for Neutrogena's Healthy Skin Custom Glow Blush & Bronzer in # 50 Raisin Glow and Healthy Skin Custom Glow Bronzer in #70 Sunrise Glow. You know, I am surprised that these blushes and bronzers by Neutrogena do not get more attention in the Blogosphere/Vlogosphere!!! They really are just beautiful. I am so impressed with the texture and pigmentation. 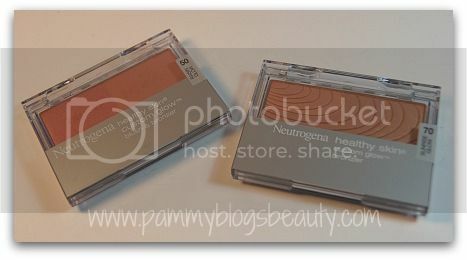 These are the first blush and bronzer items that I have tried from Neutrogena. I like them so much that I would love to explore the rest of the range! These "Healthy Glow" products were very well named. They do just that: make you look healthy and give you a glow! I just love the effect that these products have on my complexion. The glowy and luminous blush and natural looking bronzer impart such a glowy look! The combo of the color and the glow make me look like I "have some color" (a major feat with my fair skin!) and just make me look healthier (hence the Healthy Glow name, right?). For me, the packaging is a bit underwhelming (especially with such a great product!!!). Don't get me wrong, the packaging isn't bad. It just isn't anything special. The compacts are sturdy and of good quality. There is a little brush included. But, I never use those. I just prefer my own blush brush. Also, there is a small mirror included inside the flip up lid. This product is a blush and bronzer in one! The left side of the pan is the blush and the right side is the bronzer. 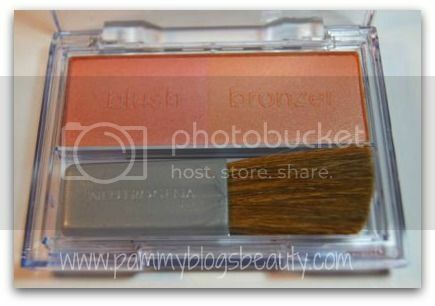 You can either apply them separately or you can swirl them together for a bronzy blush. Personally, I find that I usually apply them separately. 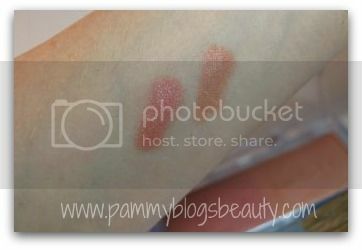 This product is soooo pigmented! I need to just barely touch my brush to the pan to pull up plenty of product to work with. The blush is a lovely rose pink that really brightens up my face. The bronzer gives me a tan glow. 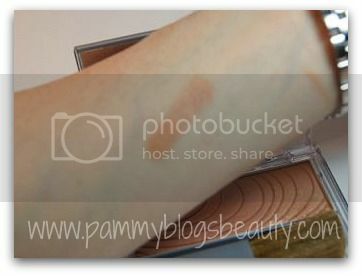 This is a lovely and natural looking medium-pigmentation bronzer. It actually works really well for my fair skin! I have such a hard time with bronzers as many end up making me look orange. I apply this bronzer with a very light hand in the "3" region of my face (hollows of cheeks around edges of forehead and down the nose). This product gives me a "tan" look and works well for contouring. It is slightly shimmery but not overly glittery. It is just right!